Richard Kepple Steele was born March 21, 1920, in Greensburg, Westmoreland Co., PA, and died October 18, 1996, in Carmichael, Sacramento Co., CA, at age 76. Buried in Sierra Hills Memorial Park, Sacramento, Sacramento Co., CA. He is the son of Donald Carlyle Steele of Unity Twp., PA, and Dora Martha Kepple of Salem Twp., Mechlings Pct., Westmoreland Co., PA.
Elizabeth Ellen "Betty" Larson was born June 16, 1920, in Pittsburgh, Allegheny Co., PA, and died January 3, 2002, in Carmichael, Sacramento, CA, at age 82. Buried in Sierra Hills Memorial Park, Sacramento, Sacramento Co., CA. She is the daughter of Walter Emanuel Larson of Farmington Twp., Waupaca Co., WI, and Helen Frazer of Pittsburgh, Allegheny Co., PA.
Richard Kepple Steele (age 24), a bachelor, and Elizabeth Ellen "Betty" Larson (age 24), a maiden, were married June 24, 1944, in Wilkinsburg, Allegheny Co., PA.
Robert Wayne "Bob" Steele: Born August 17, 1948, in Gainesville, Alachua Co., FL. Married October 9, 1971, in San Bernardino Co., CA, to Cheryl L. Beaudett: Born June 1, 1948, in Unknown. Divorced May, 1976, in Santa Barbara Co., CA. Cheryl L. (Beaudett) Steele then married March 18, 1978, in Santa Barbara Co., CA, to Mikael Hunter Johnson: Born August 30, 1950, in Los Angeles Co., CA. Linda Marilyn Steele: Born June 26, 1951, in Ventura Co., CA; Died December, 2000, in Orangevale, Sacramento Co., CA (age 49). Buried in Sierra Hills Memorial Park, Sacramento, Sacramento Co., CA. Married November 3, 1973, in Sacramento Co., CA, to Bruce Edward Davis: Born December 2, 1949, in Unknown. Lived in Orangevale, CA. Richard Larson "Rick" Steele: Born April 16, 1955, in Cincinnati, Hamilton Co., OH; Died May 27, 1993, in Carmichael, Sacramento Co., CA (age 38). Buried in Sierra Hills Memorial Park, Sacramento, Sacramento Co., CA. Married to Janice Marie Calit: Born September 17, 1970, in Solano Co., CA. Divorced before 1991. Janice Marie (Calit) Steele then married December 7, 1991, in Minden, Douglas Co., NV, to Lee Michael Van Allen: Born May 22, 1967, in Sacramento Co., CA. 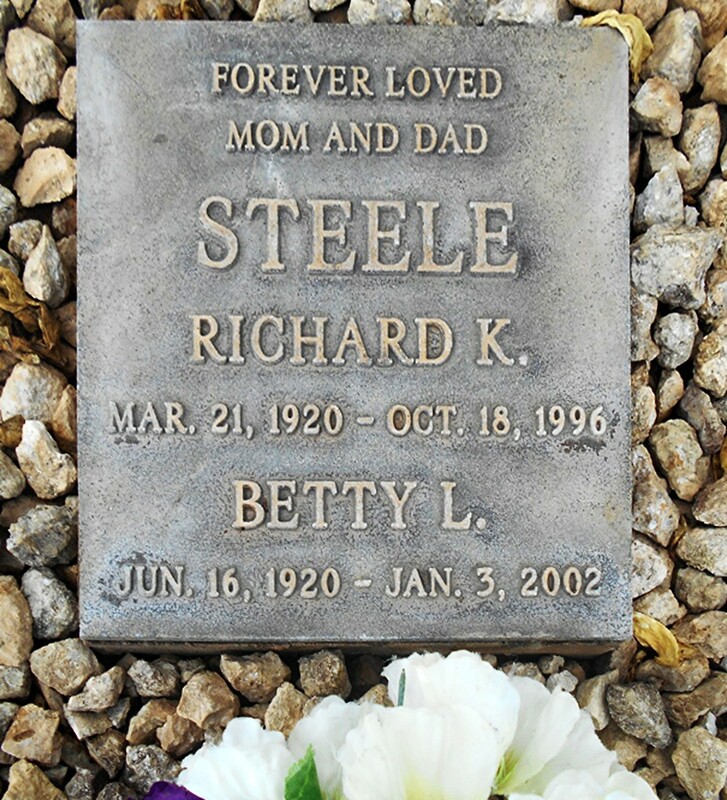 Richard Kepple Steele and Elizabeth Ellen "Betty" (Larson) Steele are buried in Sierra Hills Memorial Park, Sacramento, Sacramento Co., CA. Thanks to Find-A-Grave for making this image available. 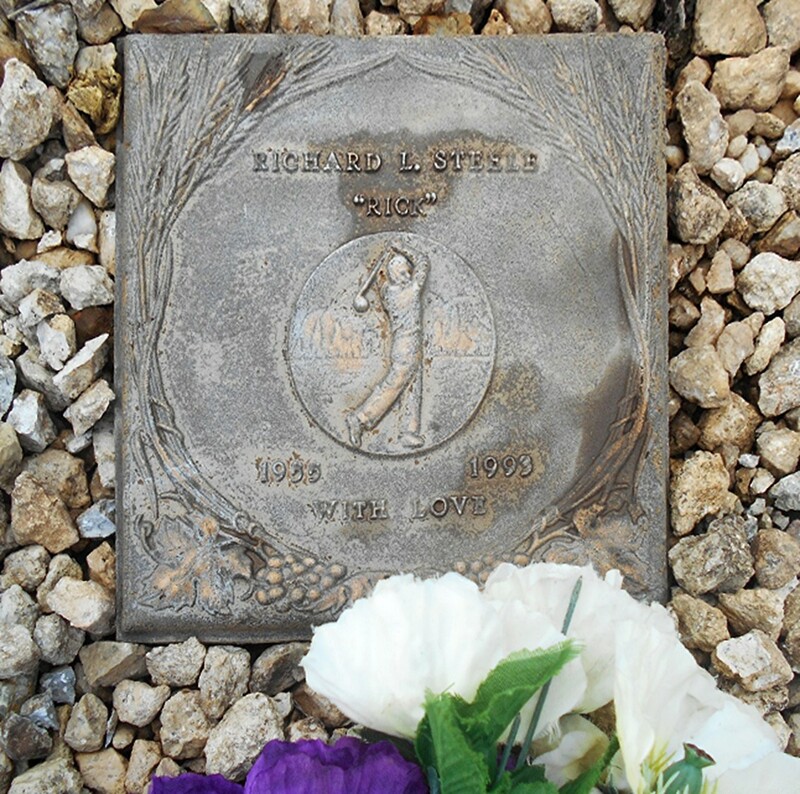 Richard Larson "Rick" Steele is buried in Sierra Hills Memorial Park, Sacramento, Sacramento Co., CA. Thanks to Find-A-Grave for making this image available. 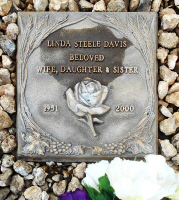 Linda Marilyn (Steele) Davis is buried in Sierra Hills Memorial Park, Sacramento, Sacramento Co., CA. Thanks to Find-A-Grave for making this image available. The 1910 U. S. Census taken on April 15, 1910, shows Homer S. Buchanan (age 27) born in Pennsylvania to Pennsylvania-born parents is a Teamster Contractor living at 507 Stanton Street, 4th Ward, City of Greensburg, Westmoreland Co., PA. Living with him is his wife of 7 years, Sarah Buchanan (age 31) born in Pennsylvania to Pennsylvania-born parents. Also living there is his daughter, Erma Buchanan (age 3) born in Pennsylvania to Pennsylvania-born parents. Two unmarried boarders also live in the household, both born in Pennsylvania to Pennsylvania-born parents: Nora Kepple (age 19); and Dora Kepple (age 16). The 1920 U. S. Census taken on January 5, 1920, shows Walter E. Larson (age 31) born in Wisconsin to Swedish-born parents is an Engineer at a Manufacturing Company renting his home at 579 East End Ave., 14th Ward, City of Pittsburgh, Allegheny Co., PA. Living with him is his wife Helen Larson (age 27) born in Pennsylvania to Irish and Pennsylvania-born parents. Also living there is their daughter Olive W. Larson (age 2) born in Pennsylvania to Wisconsin and Pennsylvania-born parents. The owner of the house is also living there, a widow who should be Helen's mother: Elizabeth Frazer (age 52) born in Pennsylvania to Pennsylvania and Irish-born parents. Living with Elizabeth is her son Rees B. Frazer (age 17) born in Pennsylvania to Irish and Pennsylvania-born parents, who is an unmarried Clerk at a Steel Company. Living in the Frazer household are two unmarried nieces: Elizabeth W. Palmer (age 22) born in Pennsylvania to Canadian and Pennsylvania-born parents who is a Stenographer at a Laboratory Company; and Minnie Palmer (age 17) born in Ohio to Canadian and Pennsylvania-born parents, who is a Check Girl at a Telegraph Company. Richard Kepple Steele was born March 21, 1920, in Johnstown, Cambria Co., PA.
Elizabeth Ellen "Betty" Larson was born June 16, 1920, in Pittsburgh, Allegheny Co., PA. The 1930 U. S. Census taken on April 14, 1930, shows Walter E. Larson (age 41) born in Wisconsin to Swedish-born parents and first married at age 28 is a Mechanical Engineer at Jaels Manufacturing Company owning his home valued at $12,000 at 914 Milton St., 14th Ward, City of Pittsburgh, Allegheny Co., PA. Living with him is his wife Helen Larson (age 37) born in Pennsylvania to Irish and Pennsylvania-born parents and first married at age 24. Also living there are their two daughters, both born in Pennsylvania to Wisconsin and Pennsylvania-born parents: Olive W. Larson (age 12); and Betty E. Larson (age 9). The 1930 U. S. Census taken on April 4, 1930, shows Donald C. Steele (age 40) born in Pennsylvania to Pennsylvania-born parents and first married at age 25 is a High School Mathematics Teacher owning his home valued at $5,000 and is living at 341 Concord Avenue, 1st Ward, City of Greensburg, Westmoreland Co., PA. Living with him is his wife, Dora M. Steele (age 36) born in Pennsylvania to Pennsylvania and Indiana-born parents and first married at age 22. Also living there are his two sons, both born in Pennsylvania to Pennsylvania-born parents: Donald C. Steele, Jr. (age 13); and Richard K. Steele (age 10). The 1940 U. S. Census taken on April 16, 1940, shows Walter E. Larson (age 51) born in Wisconsin with 4 years of College and 5 years ago was living in the same house is a Mechanical Engineer at a Railroad Equipment Factory owns his home valued at $8,500 and is living at 914 Milton St., 14th Ward, City of Pittsburgh, Allegheny Co., PA. Living with him is his wife, Helen F. Larson (age 47) born in Pennsylvania with 4 years of High School and 5 years ago was living in the same house. Also living there are his two unmarried daughters, both born in Pennsylvania and 5 years ago were living in the same house: Olive Larson (age 22) with 4 years of College, a Typist at of Life Insurance; and Elizabeth Larson (age 19) with 2 years of College. 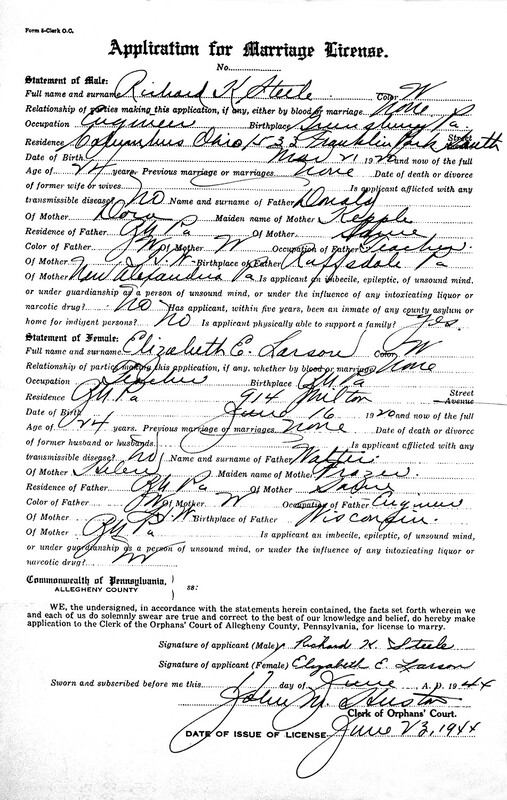 Richard Kepple Steele and Elizabeth Ellen "Betty" Larson Marriage License. Richard Kepple Steele and Elizabeth Ellen "Betty" Larson Marriage Record. At an afternoon ceremony on June 24, Miss Betty Ellen Larson, daughter of Mr. and Mrs. W. E. Larson of Regent Square, became the bride of Richard Kepple Steele, son of Mr. and Mrs. D. C. Steele of Regent Square, in the Calvary Lutheran Church, Wilkinsburg, with Dr. A. W. Steinfurth officiating. The bride wore a gown of white net and jersey with fingertip veil and carried a colonial bouquet of white roses centered with an orchid. Her sister, Mrs. R. W. Worthing of Boston, Mass., was the matron of honor and wore a gown of pink marquisette. She carried a colonial bouquet of pink roses and blue snapdragons. Donald Steele of Buffalo, N. Y., was his brother's best man, and the ushers were Albert Helquist and A. Knox Bassett. A reception in the Penn-Lincoln Hotel followed the ceremony. After a short trip Mr. and Mrs. Steele will be at home in Columbus, O.
Robert Wayne "Bob" Steele was born August 17, 1948, in Gainesville, Alachua Co., FL. Linda Marilyn Steele was born June 26, 1951, in Ventura Co., CA. Donald Carlyle Steele died Tuesday, October 6, 1953, at his home, Pittsburgh, Allegheny Co., PA, at age 64. Dr. Donald C. Steele, 64, principal of Baxter Junior High School since 1939, died yesterday morning at his home, 969 LaClair Street. Dr. Steele had been active in school administrative affairs for many years, serving schools in Johnstown, Greensburg, and McKeesport, before coming to Pittsburgh City schools. He had been a professor of mathematics at the University of Pittsburgh, and also served at Westinhghouse High School before going to Baxter. Two of Dr. Steele's text books, one on mathematics and one on educational measurements, are presently used in the Pittsburgh schools. A native of Greensburg, he received his B. A. from Washington and Jefferson College and his Master's and Ph.D. from the University of Pittsburgh. Dr. Steele is survived by his wife, Mrs. Dora Kepple Steele; two sons, Donald C.., Jr., of Mt. Lebanon, and Richard K., of Camarillo, Ca. ; two brothers, Meyers H., of Gary, Ind., and Howard B., of Mt. Lebanon; two sisters, Mrs. Sara S. Ridenour, Pittsburgh, and Miss Josephine Steele, Scottdale, and three grandchildren. Funeral arrangements are incomplete. Richard Larson "Rick" Steele was born April 16, 1955, in Cincinnati, Hamilton Co., OH. 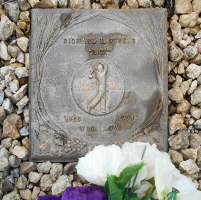 Richard Larson "Rick" Steele died May 27, 1993, in Carmichael, Sacramento Co., CA, at age 38. Buried in Sierra Hills Memorial Park, Sacramento, Sacramento Co., CA. 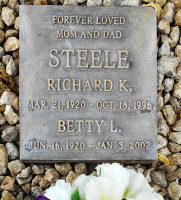 Richard Kepple Steele died October 18, 1996, in Carmichael, Sacramento, CA, at age 76. Buried in Sierra Hills Memorial Park, Sacramento, Sacramento Co., CA. 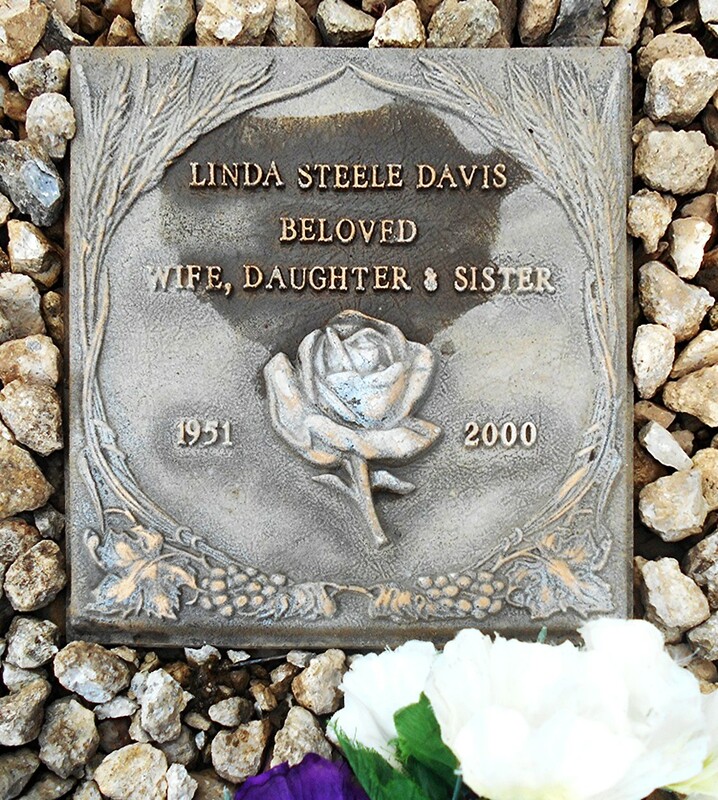 Linda Marilyn (Steele) Davis died December, 2000, in Orangevale, Sacramento Co., CA, at age 49. Buried in Sierra Hills Memorial Park, Sacramento, Sacramento Co., CA. Betty Ellen (Larson) Steele died January 3, 2002, in Carmichael, Sacramento, CA, at age 82. Buried in Sierra Hills Memorial Park, Sacramento, Sacramento Co., CA. Richard Kepple Steele, American structural engineer, educator. Member American Concrete Institute, Society Experimental Stress Analysis (past officer). Steele, Richard Kepple was born March 21, 1920 in Greensburg, Pennsylvania. Son of Donald C. and Dora M. (Kepple) S.
Bachelor of Science in Petroleum Engineering, University Pittsburgh, 1941; Master of Science in Structural Engineering, University Florida, 1949; Registered professional engineer, Ohio. Senior engineer Curtis Wright Aircraft, Columbus, Ohio, 1941-1947; instructor University Florida, Gainesville, 1947-1949; division director United States Navy Civil Engineer Research Laboratory, Port Hueneme, California, 1949-1954; head of testing major component development General Electric Co. Aircraft Engine Nuclear, Cincinnati, 1954-1957; chief structural test Temco Missile and Jet Trainer, Richardson, Texas, 1957-1959; chief new product development Aero Jet, Sacramento, 1959-1971; division director California Crime Tech. Research Foundation, 1971-1975; consultant Schumacher and Associates, 1975-1977; chief energy management and control systems McClellan Air Force Base, 1977-1985; head engineering development, new product development Product Research Associates, from 1985; Instructor Sacramento State University, since 1987. Patentee in field; contributor articles to technical publications. Spouse Betty Larson, June 24, 1944.